I hear from long-time residents of Amador County, California, that our native redbud (Cercis occidentalis syn C. orbiculata ) is not found anywhere in that county except where planted. To me, this is a fascinating mystery, as it is commonly reported by reliable sources as occurring in the wild in that part of the state. Some have suggested it may be the soils, that redbud requires “ultramafic” (basic) soils, even serpentine, that are not common in Amador County. If you live in that part of the world, please let us know if you have seen this special plant in the wild and exactly where. Also, if you live in southern, central, or northern California, or anywhere else in the world with a summer-dry climate, let us know your experience with this spectacular shrubby tree, wild or planted. Evidently it has environmental needs that many of us are not aware of. For those who are not intimately familiar with California redbud, we supply the following description. Most California gardeners know it well. 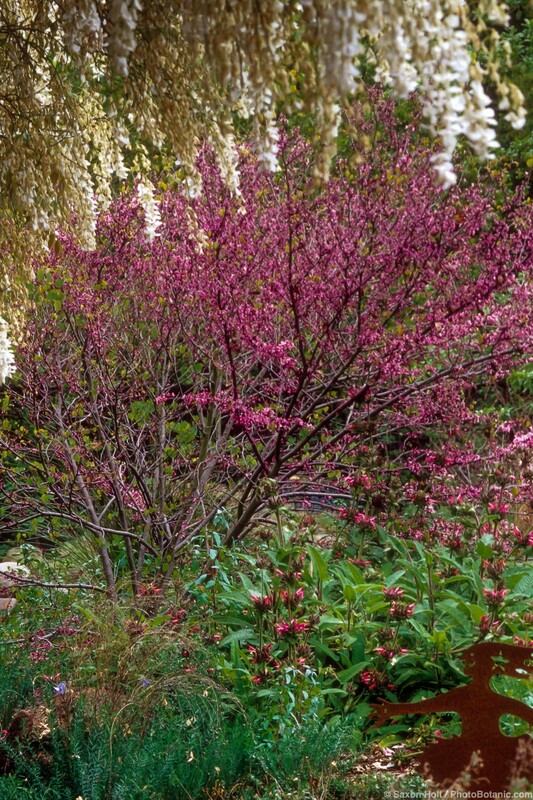 In early spring western redbud bursts forth with clusters of vivid magenta to rosy purple flowers, followed by bronzy green, heart-shaped leaves that turn apple green in summer and light yellow before dropping in fall. In winter the bare branches, silvery gray and upright, are decorated with reddish brown seed pods that persist for months. A good choice for small gardens with little space for large trees and excellent as an accent for larger landscapes, western redbud is native to canyons and slopes in the California coast ranges and Sierra foothills. 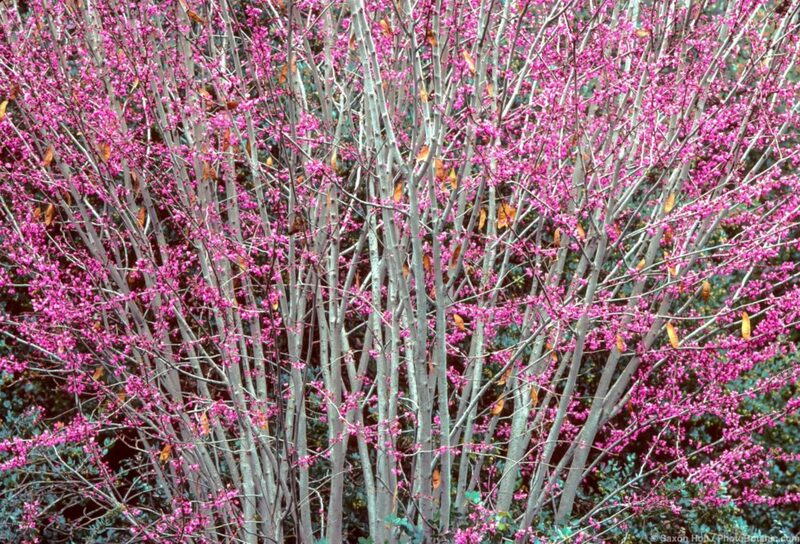 Usually planted as specimens, redbud is also effective in groves. Since each tree blooms for only two to three weeks, the more you plant the longer the show may be extended. Flowers may not appear for the first few years after planting but are well worth the wait. Exceptionally slow-growing to 15-20 feet tall and 10-15 feet wide with multiple trunks or multiple low branches if trained as a tree, western redbud is shrubby and densely twiggy without skillful pruning. Pruning should be done in winter when the plant is dormant. Western redbud thrives in full sun to light shade with good drainage. Warm summers are preferred, but not reflected heat, and flowering is most prolific following winter chill. Early growth is faster with monthly to twice monthly summer water for the first three to five years. Mature trees need little or no water once established if winter rains have been sufficient. Hummingbirds, goldfinches, butterflies, and bees are attracted to the flowers. This entry was posted in trees and tagged california native, nora harlow, trees by Nora Harlow. Bookmark the permalink. We inherited 2 Cercis I believe are C. occidentalis with our house in coastal Southern California 4 years ago. They’re planted as understory trees beneath Agonis flexuosa, which provide significant shade. My impression is that they’re still relatively young trees but it may be that their growth has been somewhat stunted by their shady placement and limited irrigation – they’re rather spindly in appearance. The soil is clay, although it’s permeated with gravel and the trees sit on a slight slope so I think their drainage is fairly good. (I haven’t had the soil tested.) They haven’t produced either flowers or leaves yet this year. Thanks for the info. It’s too early for redbud flowers in my northern California garden, don’t know about coastal southern parts of the state. My redbud planted itself on a slight slope in the shade of a huge big-leaf maple many years ago. It too is spindly and only about eight feet tall, but the flowers are gorgeous and I love the leaves. I don’t water it at all. The soil is clay but richly amended with decades of fallen leaves. We live in Chesapeake, Va. on the coast near Norfolk. We bought our California Redbud for our anniversary about 10 years ago. I am in love with it’s beautiful flowers in the Spring that turn into wonderful waterfall like, tiny burgundy hearts, and then into beautiful larger leaves of green and burgundy. Beautiful to behold in all seasons. I fear we would lose it May of 2010 when a freak wind storm did a lot of damage in our yard. The tree was split right down the middle for about 15″ or so. We quickly went looking for “tree patch” to stop water from getting into the main trunk and rotting it. This year we have an abundance of seed pods and were wondering how we might plant them to poduce more of these special redbuds. Jenny – Thanks for dropping by. I must say I was surprised to see you writing from Chesapeake, as I grew up in Newport News and loved the Eastern Redbud tree. Both are a bit difficult to start from seed, needing scarification. Here is one on-line reference from the San Francisco Chronicle website. Thank you for the online references. I will read these with interest and see if we can be successful in establishing one or two more of these wonderful California Redbuds. I have lived in California my whole life and traveled much of it. Until I moved to Lake County in 2004, I do not recall ever seeing a redbud as a bush or as a tree. They are every where here, every yard and open space in town or county seems to have them. Go out of county and I spot very few. Kenneth, thanks for that information. That’s interesting. Redbud may be less common in the wild than is usually assumed. It’s said to be found in foothills throughout central and northern California and at higher elevations in southern parts of the state, but most redbuds I see have been planted. Like willows and lilacs, just stick a cutting in the ground, add water, and a redbud grows. Like them so all is good. I spotted this tree in the Claremont Canyon in Berkeley during a recent walk. It looks exactly like the picture. What caught my attention was the stunning contrast of red and an almost birch-like bark. Upon getting closer to it, I thought I knew what the tree was, but then I was stumped until I happened upon this page doing landscaping research. The Claremont Canyon has relatively rich soil and receives quite a bit of rain, fog and morning mist especially in the Summer time. I have a question. Can the redbud be planted in a large container? I have not seen redbud grown in a container, but I don’t see why it could not be done. Redbud grows slowly, so for quite a while it likely would thrive if grown in a commercial “cactus mix” for good drainage. Would love to hear back about your experience with this if you try it. I have a small Redbud growing in an area next to the driveway that needs to be moved. I was thinking about putting it in a container and then planting it next early spring. So time to get out the shovel.